I play basketball with some guys who have lived in Jackson and Driggs for almost 40 years. Last year, during our ridiculously low-snow winter, I asked one of them what winters really used to be like around here. His response: "it was cold and snowed almost every day. It just piled up and never melted until April." We seem to be having one of those winters again. I've decided that as long as I'm living in the snow, I might as well play in it...and this weekend was as good as it gets. 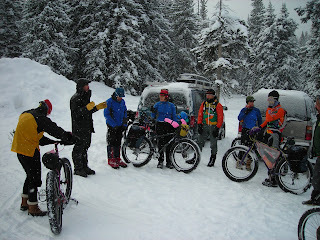 My brotha Dave B. put on a Snow Bike race up near Togwotee Pass on Saturday, and R.U. Outside was a sponsor. 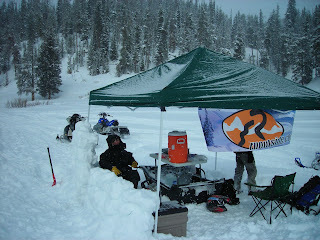 So, I went up to help patrol and coordinate things via snowmobile. Thanks to Jeff and Rebecca at Togwotee Lodge, for hooking me up on a new Yamaha Phazer Nytro 4-Stroke sled for the day. Snow conditions were EPIC, with absolutely bottomless powder, and the Phazer was a blast to ride. 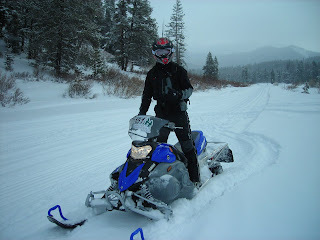 I sometimes come across as just a mountain biking-hiking-skiing type, but snowmobiling is my first love and I was psyched to spend the day riding. 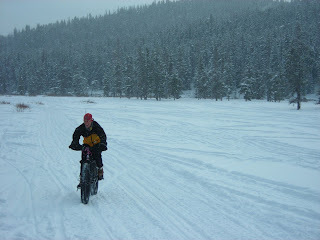 While perfect for snowmobiling or skiing, snow conditions were a little too soft for the snow bikes, even on the freshly-groomed Continental Divide trails. Thankfully, the racers who showed up were all incredibly strong, fit and pleasant. The course was a 25-mile loop, which would take these racers less than three hours in the summer. But Saturday - on soft snow, with ten-degree temperatures, erratic winds and snow falling steadily - times ranged from five hours to over seven hours. That's a long time to be out struggling to pedal your bike, and often walking it. Impressively, they all had a great time and it was inspiring to see such positive attitudes. Dave, manning the R.U. Outside aid station. It rocked. 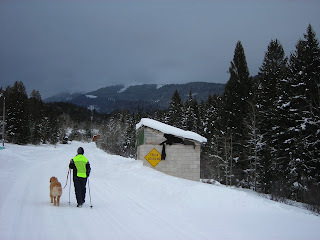 I wrapped the weekend with a great backcountry ski in the Big Holes, exact location not to be revealed. Too many people are discovering some of my previous favorites, so I need to keep a spot or three secret. I had never seen the snow so deep in this particular canyon, and flakes fell throughout the afternoon. 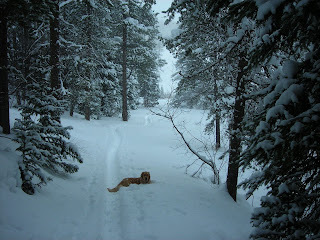 Conditions were fantastic...but Bridger thinks it's deep enough now. 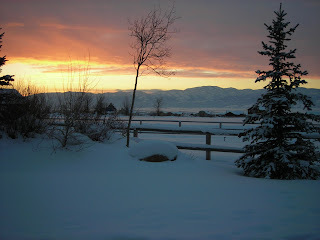 We haven't seen the sun much lately, but it did sneak through right at sunset hour Friday. Amazing colors.